What was once the master bedroom with ensuite has evolved into an entire suite dedicated specifically to the parents and their relaxation requirements: the Parents’ Retreat. Imagine having a space just for you and your partner. A zone to completely relax in, to connect with each other and designed with your needs only in mind. An extension on the master bedroom, the Parents’ Retreat can include a spacious, open-plan master bathroom and/or its own separate living room complete with lounge; or even a balcony for enjoying a drink. Offering seclusion, peace and luxury, it’s really no wonder why on viewing a display home, the Parents’ Retreat is often the space that leaves the longest, most lasting impression! How elaborate your retreat will be is only limited by your imagination. No longer satisfied with an ensuite off their master bedroom, couples are increasingly incorporating the ultimate Parents’ Retreat into their home design when building or renovating. An open bath zone, mini living room or simply a large, walk-around wardrobe are popular characteristics of the modern Parents’ Retreat. The end goal being peace, privacy, and intimacy, creating the ultimate Parents’ Retreat is a task best undertaken by a reputable building company like Your Asset Renovations. Trending in Europe, the open plan bathroom is experiencing a surge in popularity. Renovation programs like The Block have featured the open plan combination bedroom/bathroom. With an open, exposed bath, twin vanities and double shower, getting dressed for the day has never felt so luxurious. The practicalities however, may override the aesthetic appeal. Consider zero privacy, and potential mould issues after steaming hot baths, and the combined bathroom/ bedroom may not suit everyone’s taste. Make your bathroom your own, and a place that makes getting ready for the day fuss-free and enjoyable. Where the Parents Retreat is located within your house plan plays a massive role in its success. The end goal result being peace and privacy, your Parents Retreat will ideally be located in its own wing of the house, away from the noise and bustle of family life. Consider whether your budget and layout allows the Parents Retreat to be located via a second storey addition. A second storey addition is a way to create a larger Parents Retreat with space for an ensuite, walk in robe, and living space next to the master bedroom. Another advantage of going up a level to create your zone is the extra breeze and views a second storey addition brings. Optimise this advantage by including a balcony and/or lots of windows. The seclusion from the rest of the house will also make this space feel like it’s ”just for you”. If you can’t go up a level, make this space as private and quiet as possible for a zone you can truly relax in. The Walk-Around or Walk-Through Robe is gaining momentum in home design. This design has an extra opening at the far end making it different to the WalkIn Robe with only one opening. This allows for a more spacious and open ‘flow’. A design characteristic is to utilise the feature wall behind the bedhead as the anchoring base wall for your Walk-Around Robe – this design also cleverly conceals clothing and visual clutter from view. Just be sure to allow room for a large mirror, some lighting and lots of shelving to enable clever storage solutions. 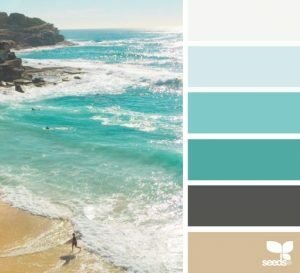 Your colour palette will ideally be soft and soothing. While white is always an enduring choice, popular for its classic versatility and timeless appeal, any colour palette that is neutral and soft is a good choice. If you keep to an all white palette, be sure to introduce some texture from keeping it from looking too flat and uninspiring. A tip is to tie this zone into the rest of the house by incorporating a finish or fixture that echoes another feature of the house. A classic white, seafoam and light timber colour palette works well for a coastal home; for a more grown-up and polished look, a charcoal and timber palette is a good choice. Above all, the colour palette you select should evoke calm and be restful and sleep-promoting. BELOW: A Hamptons Colour Palette is a good choice for a Parents Retreat in a home that has a Hamptons influence in the rest of the house. If you would like to create a luxurious Parent’s Retreat in your new home, renovation or extension, contact us today! Your Asset Renovations is not only your Sunshine Coast construction company, but also your one-stop shop for Sunshine Coast renovations, extensions, Parent’s Retreats, Granny Flats and more!